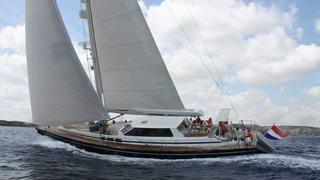 Ad Van der Vliet at Van ver Vliet Quality Yachts tells me he's taken over the central listing for the sale of the 26.7m sailing yacht Ithaka. Built by Jongert in aluminium in 2007 to a Doug Petersen design, Ithaka is the fifth hull in the yard's successful 2700M series. Lloyd’s classed, she has a modern interior in pear wood and accommodates six guests in three cabins while a 257hp Scania engine gives her a cruising speed of 8 knots.